Redington's (rod and reels) own Jennifer Gish took some time off her vacation to go out with us. She caught this nice roosterfish and what a smile! Caught on video: 5th day productions films Dave Maynard reeling in a 50lb Roosterfish as he runs down the beach in Baja California commenting, "He's so very powerful!" Denver, Colorado -- (February 28, 2012) 5th day productions, a Colorado based video production company, announced today that it has received a prestigious Telly Award for its Season 1 programming and production of "Fish the Baja" a nationally broadcast TV series shot exclusively in Baja California & airing nationwide on NBC Sports Network. The video that won was 1 out of 13,000 videos submitted from 50 states and 37 countries. Dave is surf fishing for Roosterfish in Baja California and lands a 50lb beast, then releases it back into the water, but not after struggling to lift it. Dave Maynard, Executive Producer and Host of the show, was thrilled with the win. "Winning a Telly Award has huge significance to us in the production industry. The Telly is judged by a large group of industry professionals so it shows us that we are on the right track with our production quality and style". "Fish the Baja" was nominated for 3 Telly Awards, of which two results are still pending. One of the nominations is for a "People's Telly" which will be voted on soon via You Tube with the results sometime around the end of March. This is Maynard's 3rd Telly Award, having won two previously as Producer and Host of the nationally broadcast series "Fishing Across America". 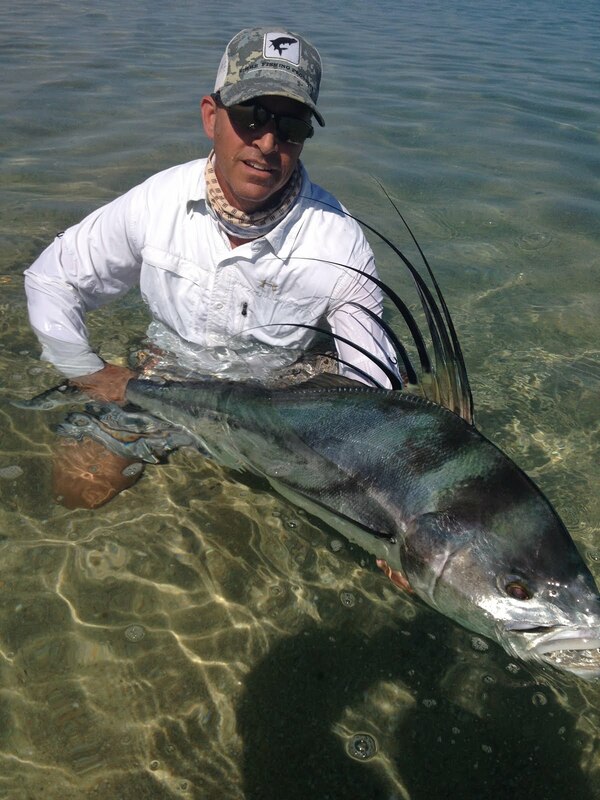 "I would like to thank Sterling Johnson at Edit Denver for his excellent work and Wesley Brough for guiding me to just the right spot to capture the spectacular footage and that monster Roosterfish", said Maynard. "Fish the Baja" airs each Thursday on NBC Sports Network at 10:30am EST / 7:30am PST, which also carries the Tour de France, the 2012 Summer Olympics and NHL Hockey. 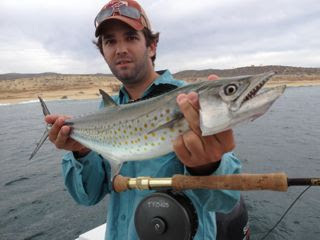 To find out more about the Fish the Baja, please visit the website www.FishTheBaja.com. A guest wants to share a boat for a day on May 15-20th. If you are interested, please email me again. Be sure to tune into Fishing The Baja TV Show with my buddy Dave Maynard. Its a great episode with me and Baja Anglers. Check it out this Thursday February 23, at 10:30 AM EST, 7:30AM PST on NBC Sports (formerly Versus). Man the guys had fun today. Nothing too big, but lots of action and lots of fun! Mi Amigo Randy Gibbs get a huge Colorado snapper on the fly. 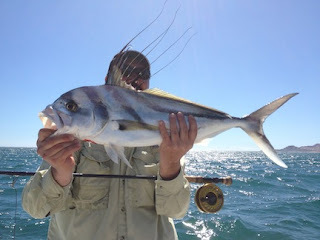 We ended the day catching a ton of roosterfish, busting fish everywhere.. Jon Hass was on the money with the casts and hooked a ton of fish.. All the fish were caught on either my rat fly or the roosta fly. Gotta love it when its that good! 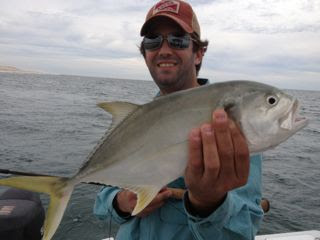 Jon caught this beauty of a rooster on the fly. Tons of whales right now, they just make a fishing day even more special. Hey. It's my 50th birthday. I can't believe I lived this long. Crazy. It must be the good living and all the sunshine. 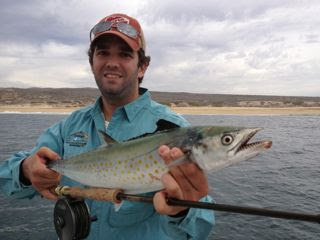 I have been in Cabo now for 16 years, and fished with all my friends over the years. What a blessing it is to still be here doing what I love to do.